This recipe I am sharing here on this page is one of my all-time favorite – it is probably the recipe for bread I have made the most times. 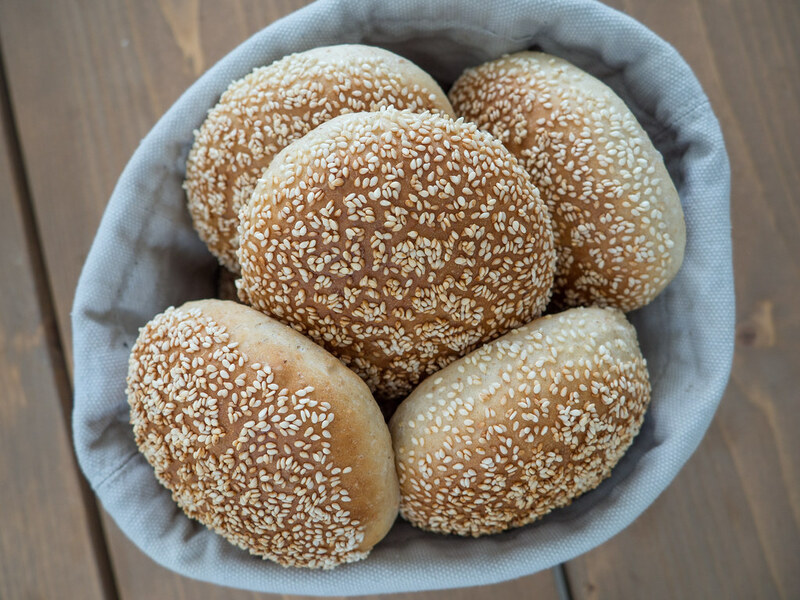 I personally think these burgers buns are the best you can get – they have a great taste, perfect color, a little crispness and soft on the inside – they are simply the best homemade burger buns if you ask me. The recipe below will give you 16 homemade burger buns. Of course, this amount can be adjusted if you decide to make larger and fewer buns or smaller and more buns. I have sometimes used this recipe when making small burger buns for Sliders. However, the recipe is well adjusted to give 16 normally shaped buns. If you decide to make more or fewer buns then you just have to adjust the baking time accordingly. In the recipe below you can substitute a little of the all-purpose flour with whole grain wheat flour. Whole grain flour contains more dietary fiber which help keeping your body in balance and makes you feel full for a longer time compared to normal all-purpose flour. 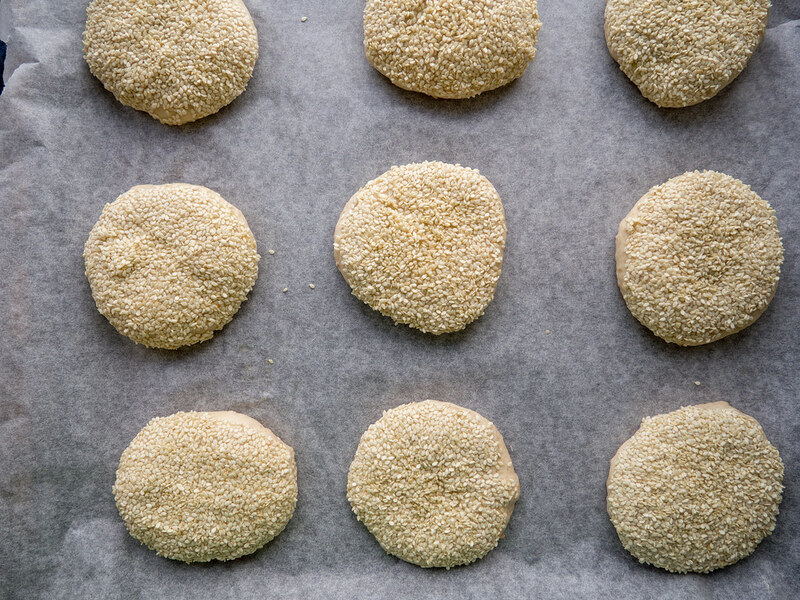 Besides making the buns healthier and more suitable for dinner, I also think adding a little whole grain flour will give the buns a perfect balance between soft- and crispness. If you do not have any whole grain flour at your home or you think it is difficult to get a hold of, then you just use regular all-purpose flour. I actually have two recipes posted here on my blog for burger buns – They are very similar. However, I will recommend this recipe here on this page as it is my favorite one. Follow the ingredient list. I have made these buns many times and I think everything is well balanced. When that said, it might be necessary to add a little more or less flour depending on the quality of the flour. However, always try using the amount I have listed in the recipe – it is typically the right amount. When you have mixed all the ingredients together it is important that you knead the bread for minimum 6-8 minutes. I know that it feels like a very long time especially if you are doing it by hands. 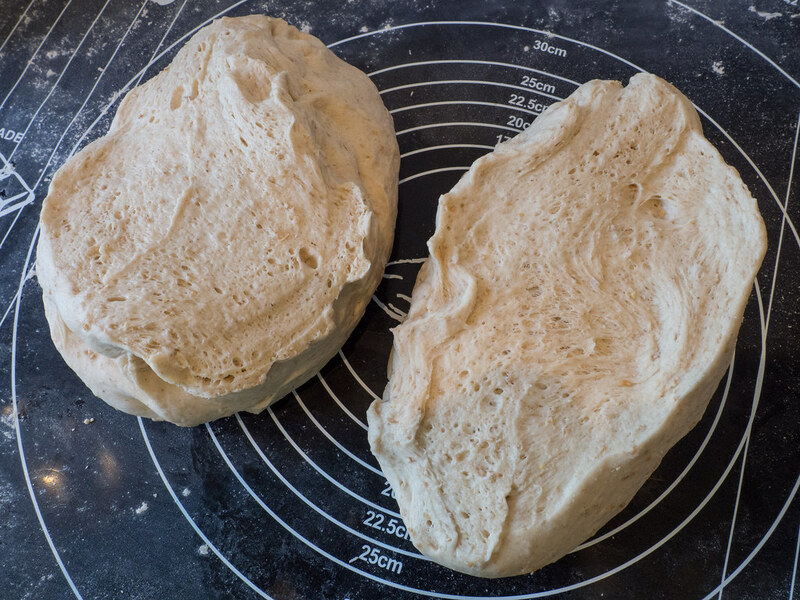 However, this kneading process is breaking down the gluten which will make the buns perfect airy and soft. You can with advantage do this using a kitchen machine/stand mixer – I normally uses manual force which also works out fine. When I am covering the buns with sesame seeds I always have a beaten egg in one dish and the sesame seeds on another plate. 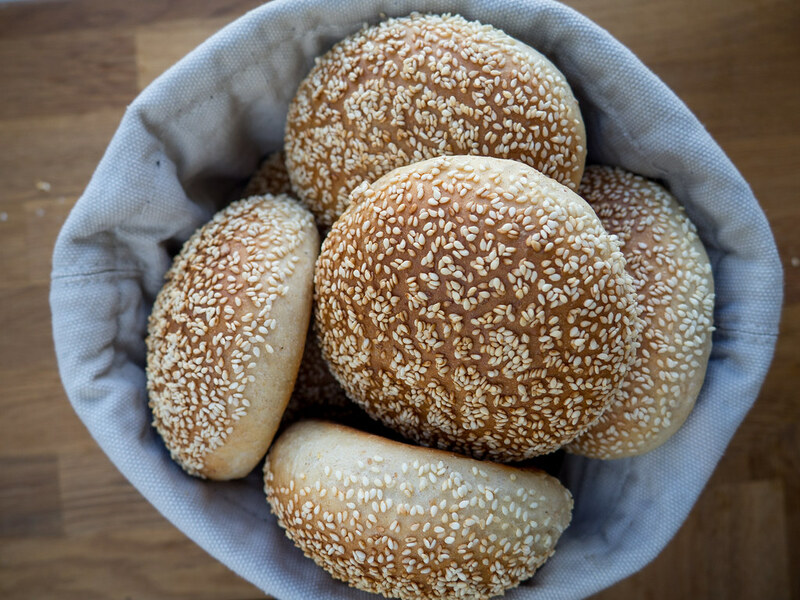 Then I dip half the buns in the beaten egg and then directly after in the sesame seeds – this way you get a perfect equal distribution of the seeds which looks great. This last factor it the one I consider the secret to these perfect burger buns. When I set the buns aside for rising, I always cover them with a sheet of plastic foil. 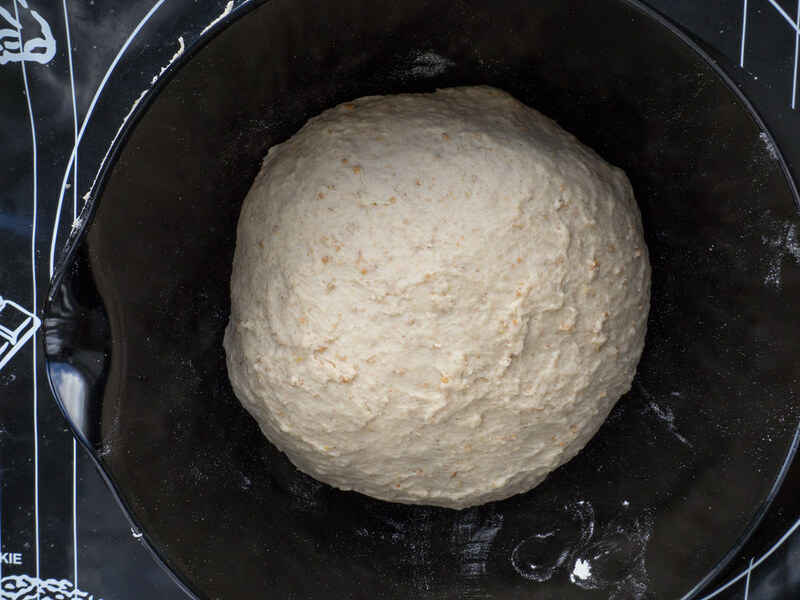 This little trick will help keep the moist and heat inside and the buns will rise more evenly. A little side note; it is a good idea to spend a little extra time when shaping the buns so that you get perfectly round buns. When I am cooking in my kitchen I love to experimenting and change in the ingredient list and instructions. These burger buns are partly a result of this experimenting and now I have made them so many times that I think everything is well adjusted. It contains a few and relatively simple ingredients and the instructions are very easy to follow. 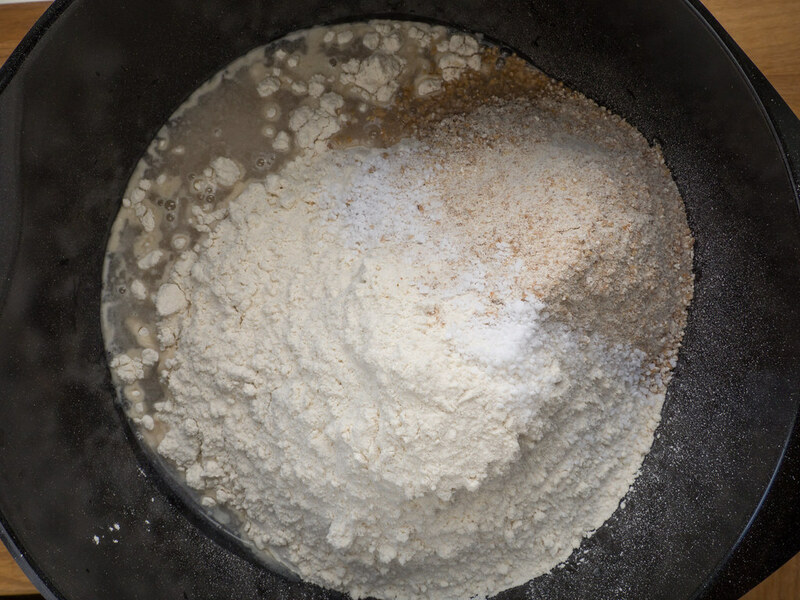 In a large bowl add, the lukewarm water and dissolve the fresh yeast. If you are using dry yeast this should be added in the step with the flour. Then add the flour, sugar and salt and mix together. 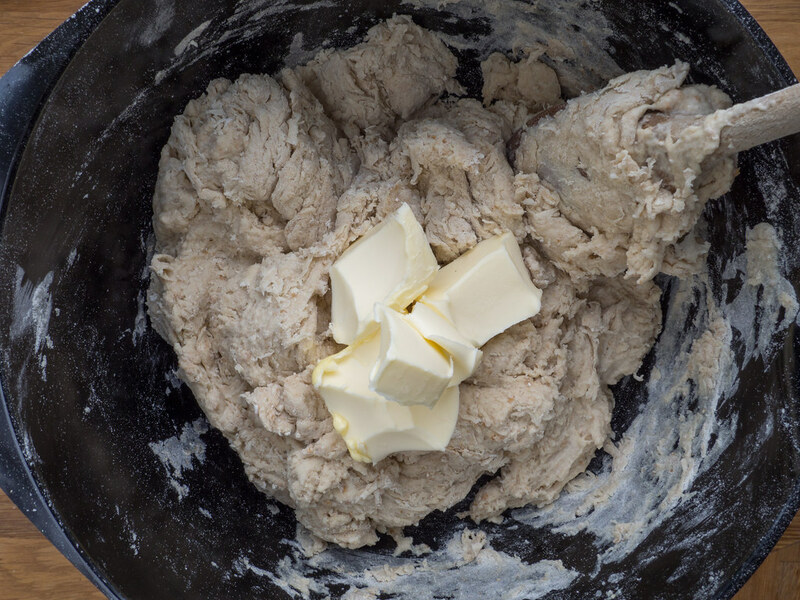 Add the soft butter and knead everything well for 6-8 minutes. 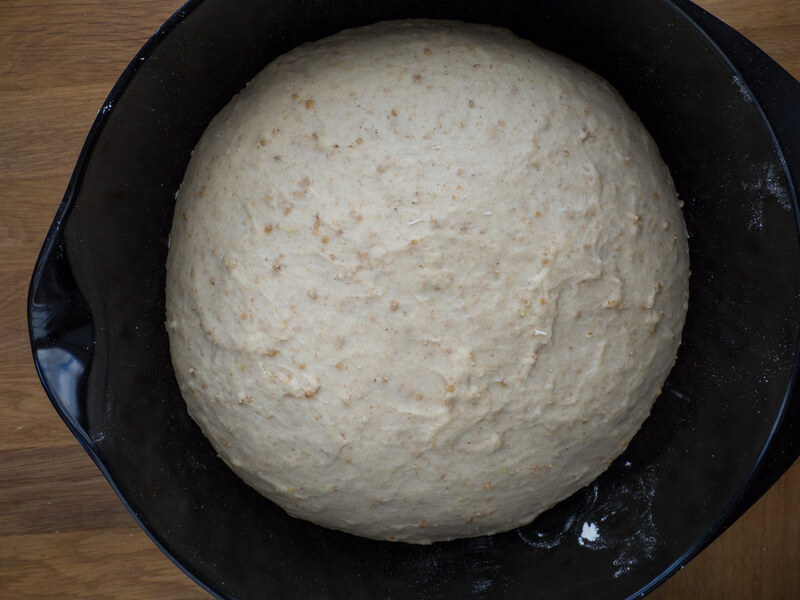 Cover the kneaded dough, set it aside and let it rise for about one hour. 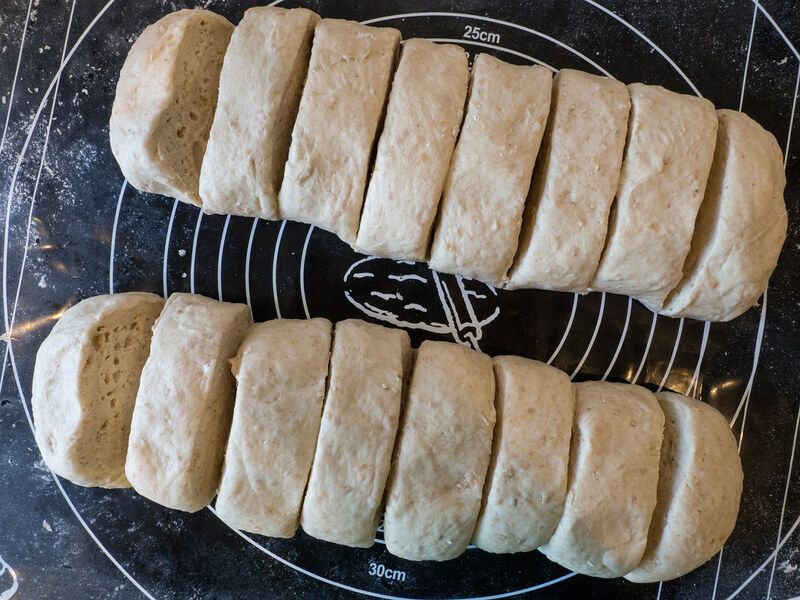 After the first rising period; divide the dough into two pieces and roll them into ‘sausages’. Divide each ‘sausage’ into eight equal sized pieces, which gives you a total of sixteen buns. Roll each of the sixteen pieces into balls and give them a gentle but firm press on the top to flatten them out. 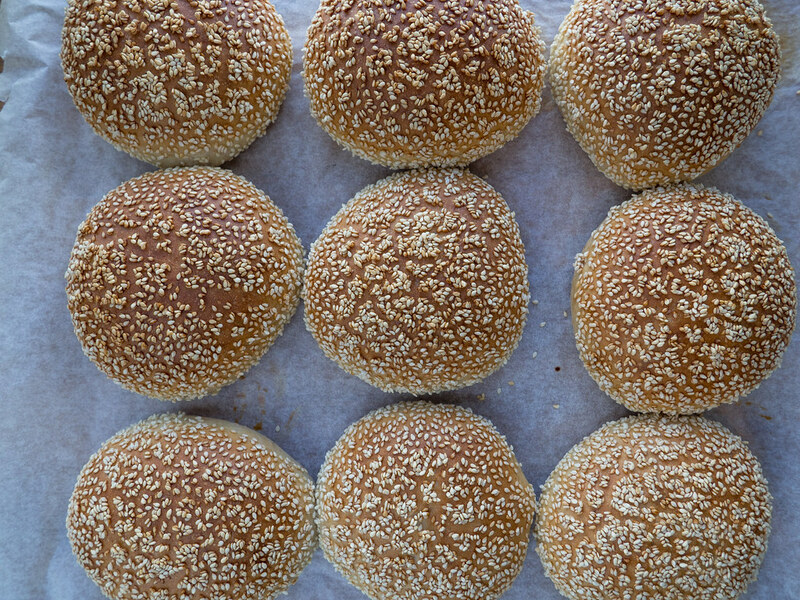 Dip the top side of the buns in a beaten egg and then in sesame seeds. 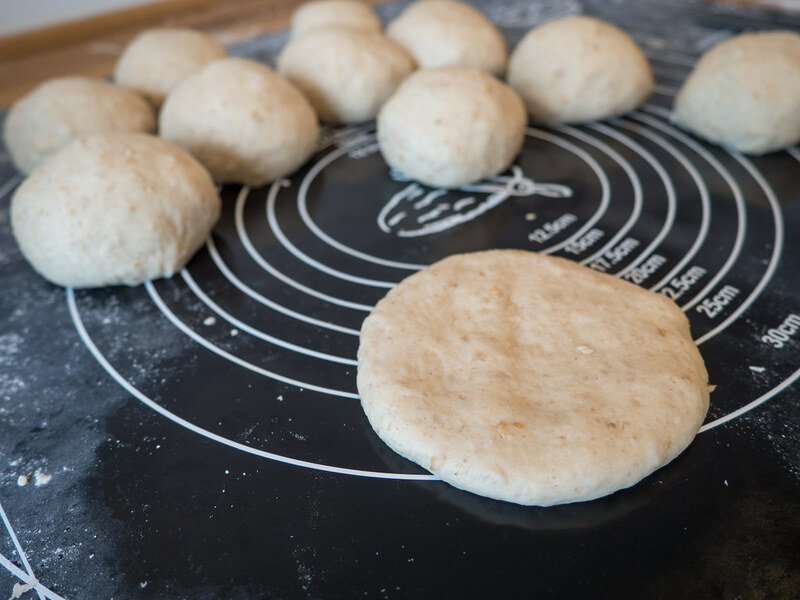 Place the buns, with a little distance in between each other, on a parchment paper covered oven plate. Now cover all the buns will plastic foil and let them rise for another 30 minutes. Finally, bake the buns for about 12-14 minutes at 220 C (430 F). Make sure to let them cool off a little bit before serving them. The burger buns are best when they have cooled off a little bit. 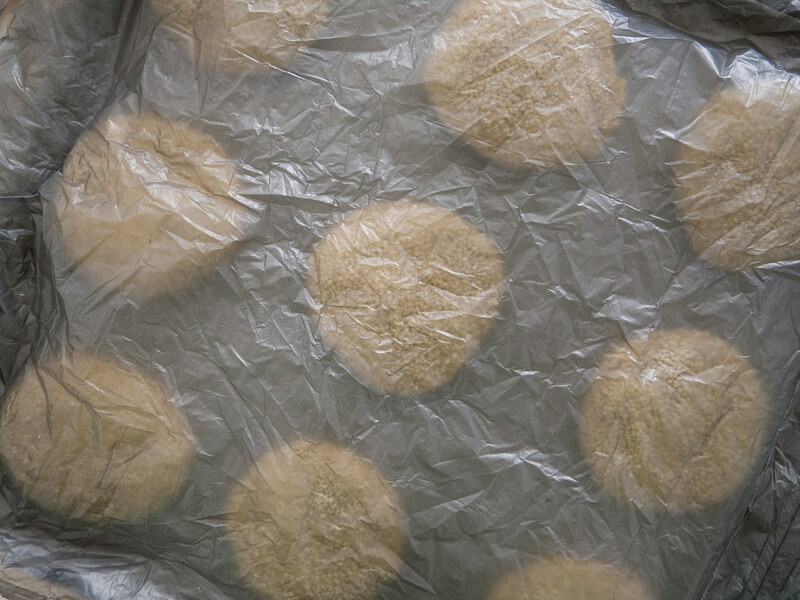 You can easily store the buns in an airtight container or plastic bag for about 2-3 days. Just reheat the buns in a toaster or in the oven for about 5-8 minutes at 200 C (400 F). You can also freeze the buns for up to 1-2 months. This way you have you own homemade burgers buns ready, when you are looking to make ham or cheese burgers for dinner. 1. In a large bowl; dissolve the fresh yeast in the lukewarm water. 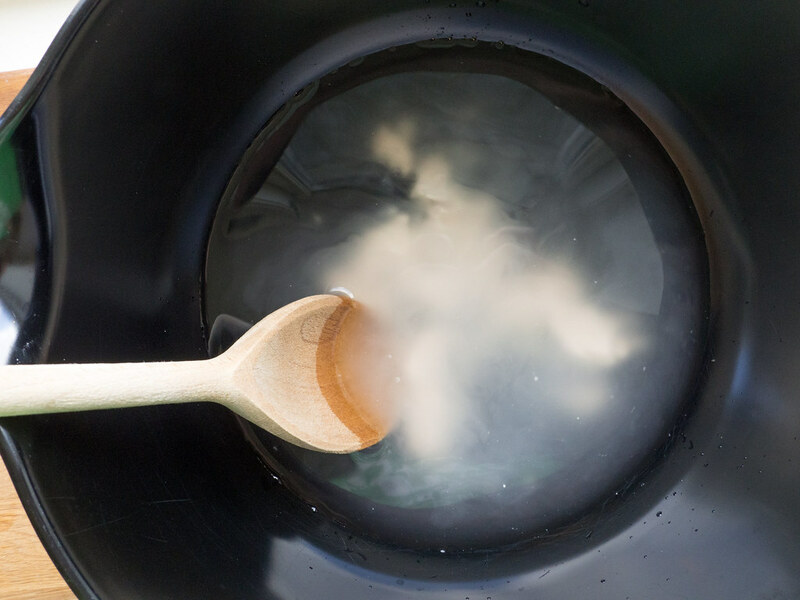 If you are using dry yeast, skip this step. 2. Add the all-purpose flour, sugar and salt. Assemble the three ingredients a little before adding the soft butter. 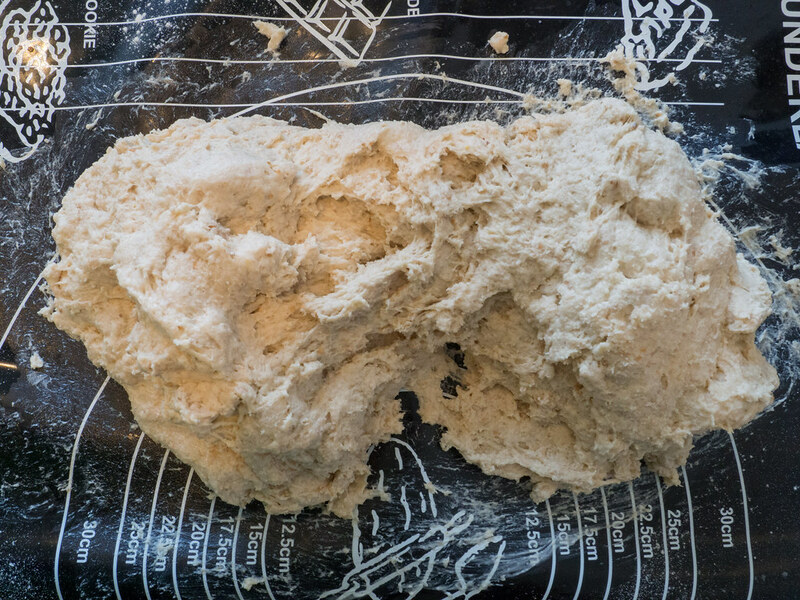 Then knead all the ingredients into a nice and smooth dough. The kneading time is about 6-10 minutes. If you are looking for little healthier and more filling buns, you can substitute 100 g (3.5 oz) of the all-purpose flour with 100 g (3.5 oz) of whole-wheat flour. 3. Cover the bowl with a dishtowel and set it aside some place warm for about 60 minutes. 4. 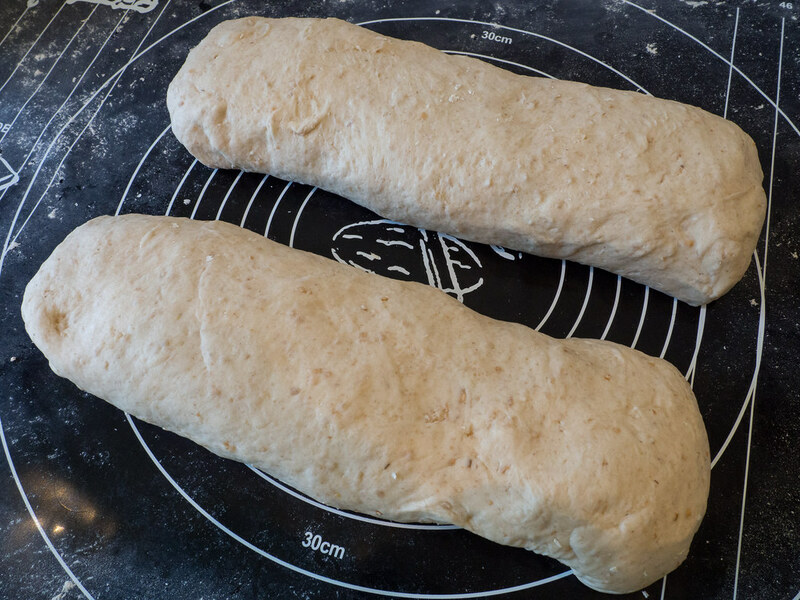 Divide the dough into two pieces and roll each of them into large ‘sausages’. Now divide each ‘sausage’ into 8 pieces and shape them into round buns. Using your fingers to gently flatten each bun. 5. 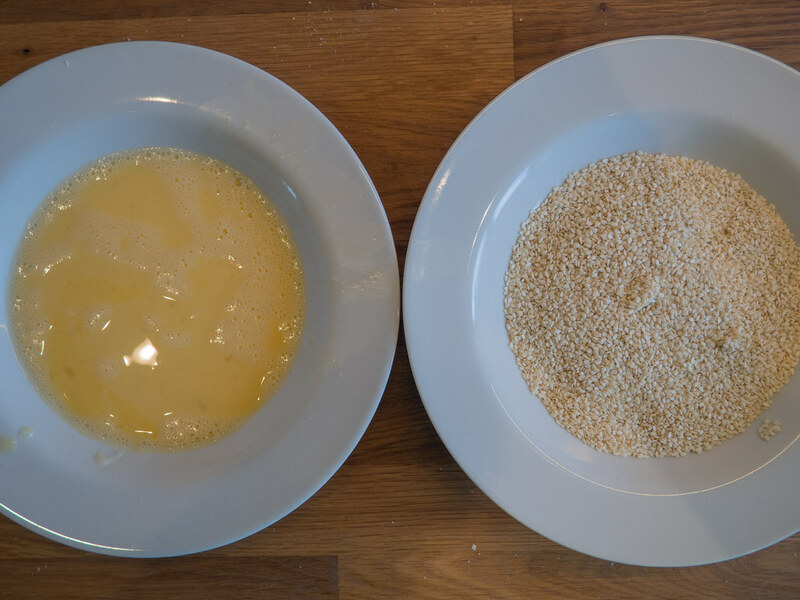 Prepare two deep bowls; one with a beaten egg and one with sesame seeds. First dip one side of the buns in the beaten egg and then in the sesame seeds. 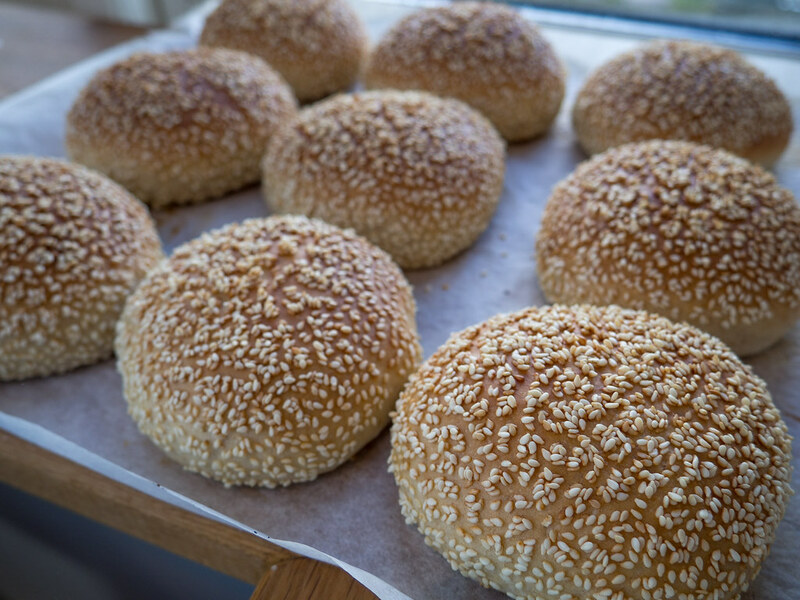 This coves the top of the burger buns with a nice layer of sesame seeds. 6. 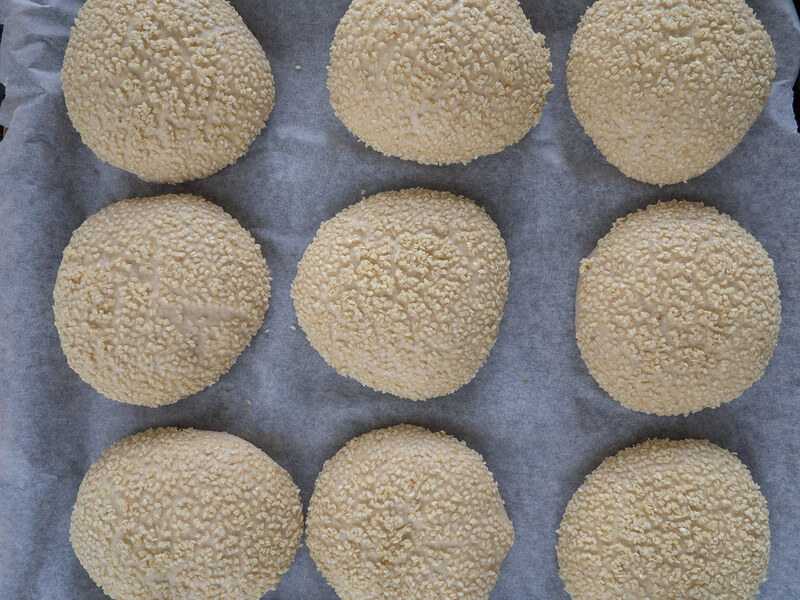 Place the sesame seed covered buns on an oven sheet covered with parchment paper. Cover the entire oven sheet with a large piece of plastic. Now let the buns rise for another 1 1/2 hours underneath the plastic. 7. Remove the plastic and bake the burger buns in the oven at 220 C (430 F) for about 12-14 minutes. 8. Let the buns cool off on an oven rack or similar.